How’d you do with the answer? I think this name is a perfect fit for ferrets. Q: What do you call a group of ferrets? A: A group of ferrets is called a Business or sometimes a Busy-ness because of how active and busy ferrets are. Pretty fitting name isn’t it? My ferrets love spending time running through their tunnels after each other and wrestling. How do you ferrets stay busy? Stop by next Monday for another Pet Pop Quiz and another chance to get an entry for November! 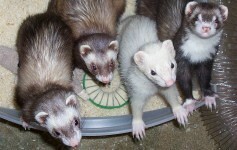 “A business of ferrets) (or busyness!) is a fantastic name! Hehehe! Clown chowder…I think that was a good guess. I probably shouldn’t admit this being a cat person, but I wouldn’t have given the right answer either before doing the Pet Pop Quizzes. Yay for the Internet!